​The Stamp Out Hunger® Food Drive, the country's largest single-day food drive, provides residents with an easy way to donate food to those in need. Customers simply leave their donation of non-perishable goods next to their mailbox before the delivery of the mail on Saturday, May 12. Letter carriers will collect these food donations on that day as they deliver mail along their postal routes, and distribute them to local food agencies. Visit stampouthungerfooddrive.us to learn more. The Letter Carriers' food drive is held annually on the second Saturday in May in 10,000 cities and towns in all 50 states, the District of Columbia, Puerto Rico, the Virgin Islands and Guam. It remains as important as ever, with many people facing economic struggles. Hunger affects about 50 million people around the country, including millions of children, senior citizens and veterans. Letter carriers see these struggles in the communities they serve, and believe that it is important to do what they can to help. "Over its first quarter-century, the food drive has only grown in importance and in impact," NALC President Fredric Rolando said. "It's an honor to be able to help people in need all across the United States – and to do so in a way that brings out the best in so many Americans." The timing is important, with food banks, pantries and shelters running low on donations from the winter holidays and with summer approaching, when most school meal programs are suspended. Last year, letter carriers collected 75.3 million pounds of food, the third-highest amount since the food drive began in 1993. That brought the total over the past quarter-century to almost 1.6 billion pounds. On May 12, as they deliver mail, the nation's letter carriers will collect the donations that residents have left near their mail boxes. People are encouraged to leave a sturdy bag containing non-perishable foods, such as canned soup, canned vegetables, canned meats and fish, pasta, rice or cereal next to their mailbox before the regular mail delivery on Saturday. Carriers will bring the food to local food banks, pantries or shelters. Several national partners are assisting NALC in the food drive: the U.S. Postal Service, the United Food & Commercial Workers International Union, the National Rural Letter Carriers' Association, United Way Worldwide, the AFL-CIO, Valpak and Valassis. This year's effort includes a public service announcement with actor and director Edward James Olmos. Co-Directors of the Williamston Food Bank, Danny Hulbert and Jill Cutshaw, would like to thank the Williamston community for all the support and generous donations we received in 2016. Thanks to the many contributions from the Williamston schools, community churches, service organizations, businesses, and local citizens, the Food Bank was able to provide food and personal items to over 100 families this holiday season! And with the help of the Kiwanis Club’s Christmas toys for kids project, and other donations of toys, cash, and trays of beautiful holiday cookies, we were able to provide Christmas presents and goodies to all the children of our client families as well. The outpouring of support we receive from folks in this community continues to inspire us all. In addition, we would like to thank all the volunteers who helped out over holiday season, it was truly a team effort. We should all be very proud to live in such a caring community. 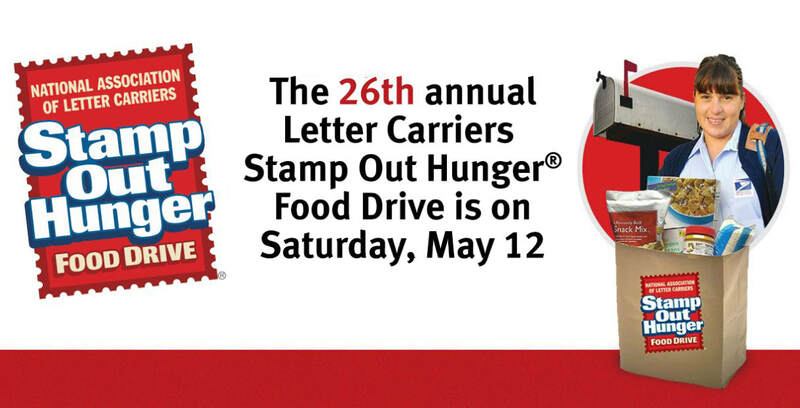 The 24th annual Letter Carriers’ Stamp Out Hunger® Food Drive is the nation’s largest one-day, providing letter carriers, other postal employees and thousands of volunteers across the nation the opportunity to meld their forces together to conduct the drive in their local communities. The availability of nutritionally adequate and safe food, or the ability to acquire such food, is limited or uncertain for 1 in 6 Americans, many of whom are in households with at least one person working. Last year’s drive collected approximately 71 million pounds of non-perishable food that was left in bags next to postal customers’ mailboxes. It was the 12th consecutive year that letter carriers have collected more than 70 million pounds of food, and it brought the drive’s grand total to more than 1.4 billion pounds of food collected. The drive is held each year on the second Saturday in May, and so Saturday, May 14, has for months been circled on the calendars of hunger-relief advocates who have watched as food supplies collected during winter holiday drives dwindle day by day. The drive also comes just before many school systems end their academic years, and that often can mean a suspension in subsidized meals for many students. “Our hard work and sacrifice will not go unnoticed, I assure you,” Rolando said. The food drive’s national partners are the U.S. Postal Service, the National Rural Letter Carriers’ Association, the United Food and Commercial Workers International Union, United Way Worldwide, the AFL-CIO and Valassis. Award-winning actor Edward James Olmos is this year’s national spokesperson, the star of food drive—promoting public service announcements (PSAs) for TV and radio in English and Spanish. New for this year’s drive is a pilot project through special food drive partner Amp Your Good, which is accepting throughout the month of May online food donations for select hunger organizations in San Francisco, in New York City, and in Greenwich, CT. Amp Your Good’s online “Crowd-Feeding” platform is designed to make it easy for postal customers to donate fresh fruits, vegetables and other healthy food, to complement the non-perishables donated on Food Drive Day. Visit stampyourgood.com to learn more. And let your hard work be known! Be sure to capture the action on Saturday, May 14, by sharing your best photos on your Facebook, Twitter and Instagram accounts. You can help us find them by using the hashtag #StampOutHunger. Who knows? Your pics could get posted on any of NALC’s social media accounts on those platforms. Check us out—simply search for the Facebook, Twitter and Instagram accounts named “StampOutHunger,” then share, post and “like” what’s there. The Williamston Food Bank would like to thank the Williamston Police Department for once again holding their highly successful—“Fill-a-Cop-Car” campaign. All the food and cash collected helped the Food Bank provide food and personal items to more than 120 local families over the holidays. We also thank the D&W Fresh Market for helping our officers make this event a huge success. The Food Bank would also like to thank all the volunteers who helped out on this project as well…loading, unloading, sorting and stocking shelves. All in all, it was a big job completed by a great team effort! support of this community, the Food Bank was able to provide food and personal items to over 120 families this holiday season. And with the help of the Kiwanis Club’s Christmas Toys-for-Kids project and many other toy donations - including, of course, help from Santa! - we were able to provide Christmas presents to the children of 50 families as well. We would also like to thank all the volunteers who helped out this holiday season, it was truly a team effort. We should all be very proud to live in such a caring community. To contact the Food Bank, call (517) 655-3813 or (517) 655-3562. The Williamston Food bank will be giving away free Halloween costumes on Saturday morning, Oct. 24th, from 10 am to noon. The Williamston Food Bank was a big winner in the recent community-wide garage sale held in the parking lot of the Community Center. The event, sponsored by Harvest House Ministries, donated all the booth fees—and the funds raised from the Harvest House space—to three charities: Top Flite Financial’s Charity Foundation’s “Toys for Angels,” the William Food Bank and the Williamston Senior Center. The hugely successful sale resulted in a donation to the Food Bank of $976.58! This generous donation was then matched by the events’ sponsors, Tim and Traci Baise, who presented the Food Bank with a “matching” donation of $980.00! According to Food Bank Co-Director, Jill Cutshaw, “this was a great idea, a fun day, and just a win-win for everyone. We thank Harvest House Ministries and we’re all looking forward to next year.” For more information or to receive food assistance contact the Food Bank at 517-655-3813. Isabel Szymecho has a heart for helping her community. For the sixth year in a row, Isabel asked her friends to bring donations for the Williamston Food Bank to her birthday party instead of a birthday gift. Isabel started doing this in Kindergarten, and has done it every year since. Recently she brought in several boxes and bags of food she collected at her birthday party to help people in need in the Williamston School district. Isabel's selfless acts of kindness inspire us here at the Food Bank to keep doing what we're doing. Because of her extra large heart for the hungry, the Williamston Food Bank honored Isabel with our Outstanding Citizen Award. This is her second award from the Food Bank.